The 2017 Toyota Prius Prime is a far, far better plug-in hybrid than its predecessor. It defaults to electric-only operation, it has 25 miles of EPA-rated electric range, and in electric operation, it is by far the most energy-efficient vehicle you can buy this year in the U.S. And when it reverts to running as a standard hybrid car, it’s rated at 54 mpg combined. 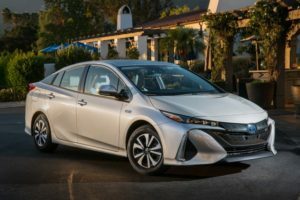 While the Prius Prime still isn’t out yet (and might not arrive in Iowa for quite a while), it deserves serious consideration if you’re considering a Prius. The original plug-in Prius basically only got 6 electric miles, while this one gets 25 EV miles, costs less, and looks better. We’re still very happy with our 2nd generation Chevy Volt, don’t get me wrong: since purchasing, we have done a 71 mile trip only using electricity and are averaging about 65 mpg on longer highway trips, while not paying a ton more than the Prius Prime will eventually cost when it becomes available for purchase in the Midwest. Regardless of that, I would definitely encourage anyone considering a Prius to opt for the Prius Prime. If you do, you’ll be a part of helping drive demand for the public charging infrastructure, something that any EV driver will appreciate. Thank goodness that Toyota seems interested in selling a lot of these.